A lot of people have been asking me recently to explain how Stab and Lunge work. I thought I'd try something in the latest beta release (opt in here) to try and make these mechanics easier to understand. 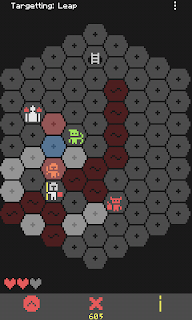 Tiles that would be affected by a Stab or Lunge are now highlighted in red while targeting a move (holding your finger down) as in the screenshots below. The tile highlighted blue indicates the player's location after the move. I'd be interested to know what people think of the change, especially if you were unsure of the mechanics beforehand. 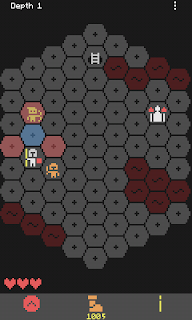 Hoplite 2.0.1 is now available to anyone that has opted-in for early releases. (Go here if you'd like to do that now) Assuming nothing goes wrong, I'll make it available to everyone else in around 12 hours or so. Thanks for all the feedback, bug reports and spelling corrections. Finish any games in progress before updating or your progress will be lost! Edit: v2.0.2 has now been released to production. 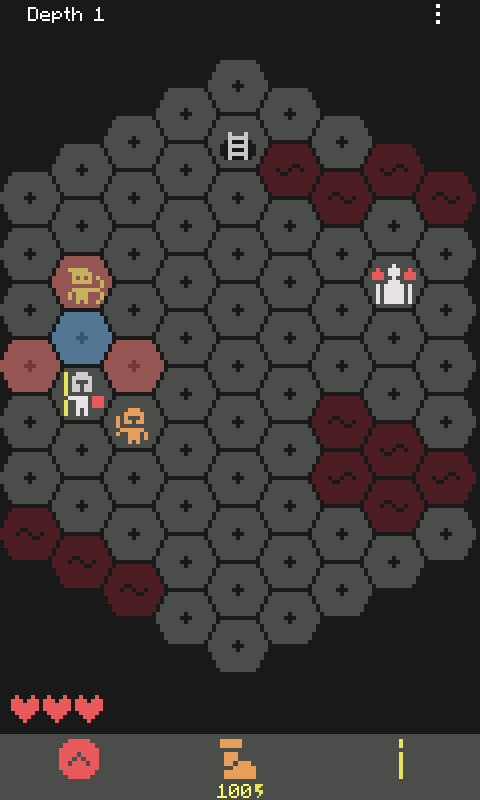 Six months after the initial 7DRL release, Hoplite 2.0 is here. A note on Hoplite Premium: This a once time purchase via Google play in-app billing. Travelling below depth 16 requires premium as well as most new abilities. It is still possible to win the game without it. For those keen, here is an incomplete list of gameplay changes with some of my reasoning. Throw and Bash no longer require energy. I wanted to make these two abilities more appealing. Bash now has a cooldown while Throw has no cost other than losing the lunge ability until you retrieve your spear. 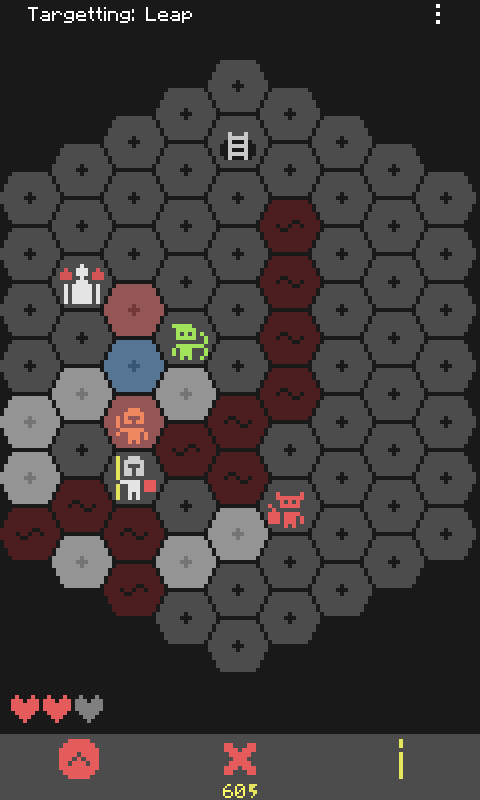 Energy regen for Leap is now a flat +10 when moving into a tile with an adjacent monster instead of being dependent on the number of adjacent monsters. Originally, I wanted to reward the player for moving into "risky" locations but the old system didn't achieve this and was overly complex. Regeneration, Surge (and the new Agility upgrade) now proc on three turns with consecutive kills instead of three kills in a single turn. These abilities feel much less random now and reward the player for thinking ahead. Knocking a bomb into a monsters now gives you credit for the kill. Waiting (skipping turns) is no longer possible without taking an upgrade. I find not having Wait results in more interesting choices and gameplay. Bash can be used as a substitute for waiting making it more useful. Altar upgrades may now require a sacrifice (reduction of max and current health.) This has made it easier to balance upgrades and results in an interesting trade-off between more powerful abilities and having a higher HP pool and hence more effective healing. Taking multiple levels of the same upgrade tends to increase the sacrifice required. Bloodlust: now gives +5 per level instead of +2 but only counts kills caused by you and requires sacrifices at higher levels. Slimes are gone. I found them uninteresting and tedious to kill. Archer and Wizard AI has been tweaked making them more deterministic.